The final of the 2013 ITA National Indoor Championships held in Charlottesville, Virginia on February 11th was surely one to remember. The University of North Carolina and UCLA fought it out until the end, with the championship ultimately decided by just two points in the third set tiebreaker of a match between UNC’s Whitney Kay and UCLA’s Pamela Montez. UNC’s Kay, a freshman and a former student at Smith Stearns clinched the victory with a forehand winner to take the tiebreaker 7-5. They were the last match playing as it was 3-3 in the team match score. 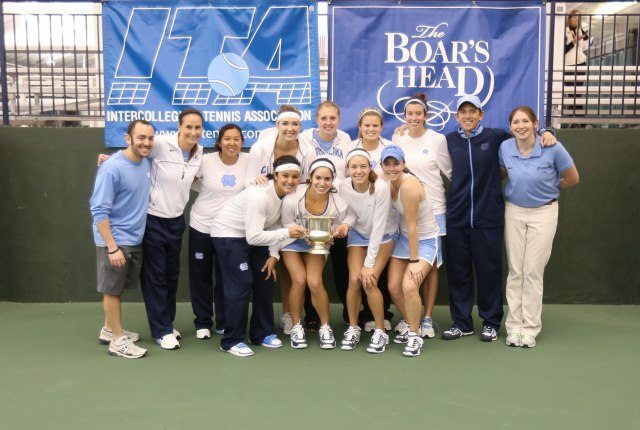 Kay’s winner sealed the championship for the Tar Heels, earning their first national championship in team history. Three other former Smith Stearns students are on both the UNC and UCLA rosters. Caroline Price plays for UNC, while both Kaitlin Ray and Catherine Harrison play for UCLA. Ray was on UCLA’s squad last year that won the National Indoors and was a finalist at the NCAA Championship. We are so proud of all four of our former students for making it to the finals of the National Indoor Championship!